*This piece originally appeared on Environmental History Now in their “Problems of Place” series. There was a stream. It ran down the side of the ancient mountain that I lived on. The most beautiful stream I’ve ever encountered. I knew every inch of that stream. I’ve always loved streams. There’s something about a stream that brings the dynamism of nature to the forefront. One large branch crashing down could alter the stream significantly. From day to day, hour to hour, one could witness how minor and major events altered the streams course. A metaphor for life, I suppose. I lived for that forest. That stream. One girl and her dogs roaming free. The paths that I traversed were remnants of prior human activity. Logging roads and former recreational horse trails. One represented a time when resource extraction dominated the area. Another represented a heyday for the tourism community around the park. Both fading. But I knew, while I walked those paths, I remembered. I returned to my forest about a decade ago. I wanted to show my partner where I grew up. Although it had only been several years at that point since I had been separated from my forest, the paths were already significantly grown over. No one walked them anymore, and thus the forest continued its reclamation process. I took it as a painful sign that those paths were part of the past, and I should be on my way. In Episode 61 of the Nature’s Past podcast, I described some of the personal details behind why I became an environmental historian and why I study state and provincial parks. What I didn’t convey strongly in that interview, however, is that I chose this path because I desperately wanted my family’s story to matter. I wanted the labour and love that my parents poured into that piece of property to matter. I wanted people to understand. And I guess, I wanted it to stop hurting. In a recent episode of Chai Chats Podcast they discussed “life dysmorphia,” or the way in which many individuals have trouble living in the moment and are always striving for a point in the future when they will feel free, when they will feel like they’ve ‘made it.’ Academia is rampant with these type of folks. Many of us are extreme perfectionists who aim to heal parts of past self through a constant striving for a fictional and fantastical future place where we can finally rest. The structure of academia rewards this kind of thinking. While we are completing our MA we are worrying about where we will do our PhD. While we are doing our PhD we are worrying about publishing and attending conferences so that we can land a future job. While we are finishing our dissertation we are encouraged to scramble for the next step, the next PostDoc, the next sessional position, the next paid gig. If we land a tenure-track position we are worrying about publishing our book so that we can get tenure and so on. Academia is a constant wheel of labour for a perceived possible future; we are rarely encouraged and often actively discouraged to live in the moment. The fact that we are surrounded by other people who are caught in the same cycle often blinds us to the fact that this is not how all people live their lives. For most of my teen years and adult life I have based much of my identity on this academic rat race and the pursuit of unrealistic perfectionism. I believed that if I worked really really hard and placed unrealistic expectations on myself then I would finally reach a point in the future where I could feel secure and worthy of that security. The only problem with this strategy is that it leaves very little room for living in the here and now. I was stunned and for the first time I was able to let myself breathe. 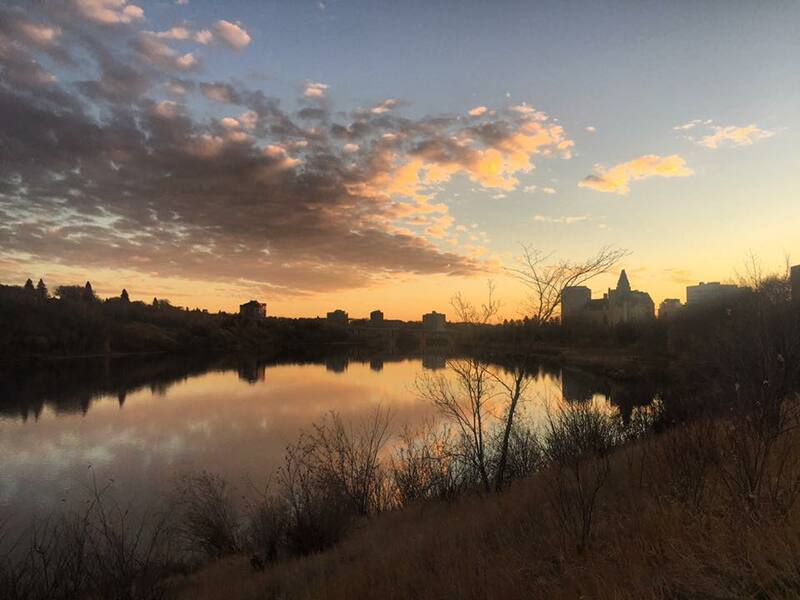 Autumn Sunset in Saskatoon, Saskatchewan. I remember the first time I arrived in Saskatoon and felt like I was coming home. It was during the second year of my PhD program, after a stint at home for the holidays. As the plane touched down at YXE I felt a sense of relief and belonging. It usually takes a period of time, about a year or two for most and longer for others, before the place one has moved to becomes home rather than the place from which one came. When I first moved to Saskatoon I assumed I would be in and out in four breezy years. I would return to the United States, somewhere, anywhere that gave me an academic job. And when one moves from the States to a place called Saskatoon, Saskatchewan, all others assume it is a weird, perhaps whimsical but nonetheless quick detour, on the way to where one is supposed to be. These assumptions were based on the naiveté of a twenty-five year old woman who had never been to Canada and who did not yet know who she was apart from this academic mission. There is a toxic ideal held up in grad school. This is the ideal of the individual who puts their head down and finishes as quickly as possible to the detriment of other aspects of their life. Pace, however, is not an indicator of success. Grad students are also expected to not put down roots while they complete their degrees in order for them to be easily capable of moving anywhere for any opportunity to stay in this academic matrix. And when one begins a program, this doesn’t sound so bad. You think that you’ll be willing to pick up and move anywhere for your career. Career comes first after all. This is easy to say when the roots have yet to form. But PhDs take a long time. They often take much longer than one originally expects. And life does not stop during them. One continues to grow, and those once-dreaded roots begin to form. Academia is a conservative institution. Individuals who wish to attain a tenure track position are expected to be flexible and so too are their partners and children. It is a system based on an outdated assumption that an academic has a spouse waiting at home to take care of all other matters and move to and fro without complaint. “Unattached” (aka single) individuals supposedly have it the easiest in the pursuit of the cherished tenure-track position. I reject the concept that anyone is unattached. It is an assumption that negates the validity of non-heteronormative romantic relationships and also negates the importance of non-romantic relationships. In the queer community we cherish the concept of the “chosen family.” These are the romantic and non-romantic relationships that we choose to turn to for love and support that are not bound by law or blood. Chosen families are important. No one is unattached. To call someone “unattached” is to negate their humanity. I’ve decided not to apply feverishly for every academic position that appears on H-Net for now. Many would likely consider this to not be a smart move. For years I did everything possible and everything I was ‘supposed’ to do in order to be able to pursue an academic career path. This was, as I mentioned above, an effort to reach a place in the future where I could relax and feel that I had finally proven myself. In the past few years, I’ve learned to slow down, and I’ve decided to prioritize other aspects of my life. My partners. My friends. My community. Myself. I set down roots in Saskatoon. I’ve decided that I’m willing to possibly give up academia in order to prioritize security and the ability to stay with those I love. And thus, I’m taking the next steps slowly. I’ve applied for my Canadian Permanent Residency so that I can stay here. This process may take over a year. In the meantime, I plan to do what makes me happy and continue to breathe. I may continue in academia, and I may not. For the first time in my life this uncertainty feels like freedom. As I take a look around at the place I’m at in this very moment…at the relationships I’ve built, the connections I’ve made in the community, the growth that I’ve experienced in this city…I am confident in saying that there actually is no problem at all.